UDL promotes equity and opportunity in the classroom for all students, and it makes for a more engaging and active learning environment. Universal Design of Learning(UDL) uses best practices to teach materials in a variety of ways and formats to ensure all learners are included in the learning activities. This means that faculty focus on making learning and their course work accessible to all students in a variety of ways. This approach requires faculty take an ongoing intentional and mindful look at how their materials are presented; offer material in multiple ways; and utilize technology, color, white space, and other variables to the students’ advantage in order to provide ample ways of demonstrating knowledge. 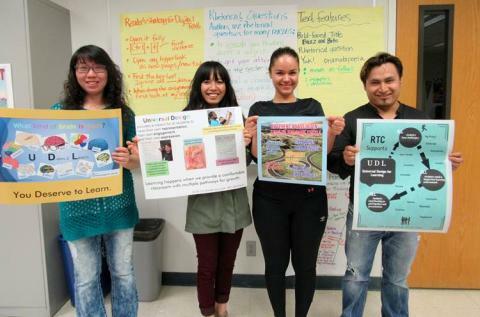 In the spring of 2015, Renton Technical College's UDL campus conversation was re-sparked with an two-week intensive online workshop for RTC faculty that expanded our focus on UDL to Virtual UDL practices to create multiple pathways to student success. The workshop was designed and facilitated by eLearning Director Liz Falconer. Twelve RTC fulltime and adjunct faculty participated in the online workshop. As part of the workshop teachers designed digital posters to promote UDL then voted for their favorites to be made into classroom-sized posters to display and promote Universal Design for Learning. Renton Technical College students are the beneficiaries of a grant from the Department of Education's Demonstration Projects to Ensure Students with Learning Disabilities Receive A Quality Higher Education. In late 2002, RTC received a three year grant from the Department of Education to help provide support to students with undiagnosed learning disabilities. In 2005, an additional three years were granted to expand the project activities to include help to all students with disabilities and to other community and technical colleges in Washington State. According to an independent evaluator, the project was successful in increasing the completion rate of all students over the course of the grant, with the greatest increases shown for students with disabilities in UDL classrooms. During the grant, over 30 programs and 4 staff departments, including 3 off-campus sites used Universal Design for Learning (UDL) to help students be more successful in college. Instructors in these classrooms implement teaching strategies which have been shown to be effective in helping students with learning disabilities. Using the UDL paradigm, these strategies are offered to the entire class right from the beginning of the quarter, which speeds up help to those who need it, and offers help to ALL students, not just those with diagnosed disabilities. Assistive technology plays an important role in helping students with learning challenges succeed. Using UDL, Renton Technical College has provided assistive technologies to students in the Pilot programs as well as made them available to all students who use the Technology Resource Center's Open Lab and Library. Some of the technologies allow books and materials to be read aloud to students, enlarge text and screen images, provide graphic display of text and use voice recognition. There are also large screen monitors, special keyboards and adjustable workstations. In the classroom, the grant has promoted the use of interactive whiteboards and LCD projectors which increase accessibility to visual materials for students. Students with disabilities who need assistance should contact the Access Services Office. One of the most innovative features of the project has been the creation of a unique Student Learning Assessment System which helps both students and instructors identify learning challenges and provide assistance directly in the classroom. This system allows students to understand and take charge of their learning strengths and weaknesses, and gives suggestions for research-based strategies that may help with their specific learning concerns. In 2009, RTC received a three year grant from College Spark to use the quantitative and qualitative lessons learned from the DOE project and apply them to a slightly different population: low income students. This project, called the Universal Design for Success project, is designed to begin as a pilot in a small number of classrooms, expanding to a larger number over the course of 3 years. Best practices were shared with the Community and Technical College system. To learn more about College Spark Washington, visit: www.collegespark.org.